Girly Girl Giveaways: Giveaway Event Coming Up at Mrs. Nespy's Frugal World! Giveaway Event Coming Up at Mrs. Nespy's Frugal World! I am participating in the above event and I cannot wait! This is a good bloggy friend of mine and I'm excited to see what all she has in store for us... the list of giveaways is extensive and is going to blow your minds! So mark your calendars for the event! It is such an amazing piece, the pictures do not do it justice! It is a dandelion, each little fluff hand-stamped. I actually wasn't sure how this would turn out but I was more than pleasantly surprised. And biggest secret- I was going to keep it for myself but the best thing about my line of work is that I can create MORE! 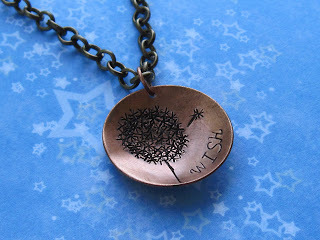 So even if you do not win you can purchase one for yourself at Joy Belle on Etsy, the new home of my hand-stamped collections. If you do not see it in the shop shoot me a message and I'll set you up. Joy is a stay-at-home-mom to three daughters. She is the wife of a worship leader & youth pastor. 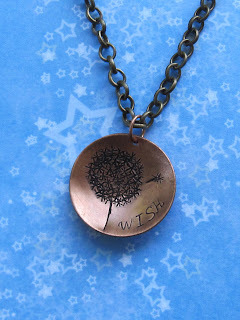 She runs her own Etsy shop selling handmade, hand-stamped sterling jewelry. Joy has taken courses in journalism, play writing, poetry, was in Honors English throughout school and has had small publications made of her work (mostly poetry). All product reviews expressed in this blog are the personal opinion of Joy. There was no compensation for these opinions though in some instances item(s) were provided for review. Thanks for the advertisement! And the piece is simply GORGEOUS! Since I'm not eligible to win, I just might have to buy one for myself!